Birthday is the special event in everyone’s lives. It is that day of the year when you feel the most special. It’s a great part of the birthday celebrations to cut a cake and celebrate with friends. 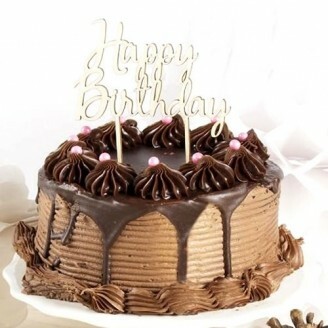 No birthday party can be imagined without a birthday cake and it remains an inseparable part of the birthday party. Doesn’t matter how old you are, you must start the birthday celebrations with cutting a cake. Choosing a cake for yourself or your loved one may get a bit tricky with so many different designs. Today we present you the best chocolate cake with beautiful happy birthday topper. The guarantee may not apply for timings during different celebrations and occasions such as Valentine’s Day, Friendship Day and Christmas etc.